Some of the key issues we are considering as we look into the next financial year are as follows: Will global growth momentum be sustained? Can geopolitical tensions derail the economic expansion? What absolute level of long-term interest rate becomes an impediment to equity prices continuing to rise? Will oil prices sustain the rally seen over the past year? And importantly, will the pace of interest rate increases be in line with current expectations – or will it surprise to the upside? Here we discuss these 5 key issues in this exclusive report for Livewire. Will global growth momentum be sustained? Global growth has been strong since midway through 2016 driven by the first globally synchronised recovery in demand we have seen in close to a decade. China’s continued domestic infrastructure build-out coupled with its regional “One Belt One Road” initiative stimulated material and commodity demand in the early part of 2016 which has collectively added to global GDP growth. Coupled with this, a resurgent USA has shown GDP growth accelerating from 2.2% in the early part of 2016 to 4.7% today as evidenced in the below chart. A turnaround in the economic fortunes of the two largest economies in the world has had positive spillover effects to almost all other economies, resulting in a period of strong economic growth. Leading indicators like the Global Purchasing Manager Indices of services, manufacturing and new orders continue to point to a robust expansion in global growth, albeit very slightly lower than the lofty pace of growth in the first quarter of 2018. There are currently surprisingly few geographies and or countries not contributing to that growth with some notable exceptions like Venezuela and other parts of South America. Fortunately for the rest of us, those economies are not sufficiently large to derail global growth. Strong global growth typically translates to strong equity markets and price appreciation in cyclical sectors of the market. This is one of many reasons why we at Paradice currently favour investments in the likes of BHP, Iluka and James Hardie. Can geopolitical tensions derail the economic expansion? More recent causes of volatility in markets can be attributed to an outbreak of geopolitical tensions as the USA attempts to reassert its economic dominance over its trading partners by renegotiating trade deals and treaties with pretty much all of their trading partners without exception. It's hard to know how much of this is rhetoric and positioning but it does seem evident from statements made by the likes of the “Little Rocket Man” and the “Dotard” that some politicians have started negotiations with seemingly outlandish claims to then later reconcile to positions that most of us might consider as more reasonable. For this reason, and because we generally believe rationality prevails (questionable when politics is involved admittedly), our base case is that today's geopolitical and trade tensions do not escalate into something that might derail current strong levels of global growth. Thus the preference in our portfolios for cyclical equity exposures versus more defensive businesses, given the greater upside to valuations typically evident. What long-term interest rate is an impediment to equity prices? As global growth stays strong, and Global Central Bank Quantitative Easing (QE) unwinds it is logical to expect a continued drift upwards in long-term interest rates as central banks buy less of their governments own paper. As can be seen from the below chart, the likes of the US Federal Reserve has already started the process of extricating themselves from QE whilst the ECB is no longer adding to their balance sheet by buying long-term government bonds. At Paradice, our broad expectation is that long-term interest rates continue to rise and that this will not impact equity returns unless, and until, the US 10-year government bond is circa 3.5%. At this level and above we perceive that monetary policy and financial conditions more broadly are becoming less accommodative or indeed outright contractionary. The speed with which the USA 10 year reaches 3.5% will also be an issue as sharp moves in bond markets can lead to dislocations in other asset classes, given every asset in the world is priced off the USA 10 year government bond. Rising long-term interest rates will, however, impact the valuation of long duration assets like toll roads and other infrastructure assets, so currently we have a preference for shorter duration cyclical exposures that benefit in a rising rate environment. Macquarie Bank and Computershare are two companies that are very well managed and have parts of their businesses that will benefit from greater activity and rising rates. Will oil prices sustain the rally seen over the past year? Oil has been on a tear since the middle of 2017 as shown in the below chart. Up until then, oil market participants were very concerned about the growth in USA Shale oil output and the prospect of that flooding the market and suffocating oil prices. What has become obvious to all participants now is that demand growth is stronger than expected and, given the disruptions with OPEC producers Venezuela and Nigeria, supply cannot keep up. This has lead to a continued decline in oil inventory to levels which are at or below the 5-year average, as per chart below. Liquified Natural Gas demand has also been growing much faster than anyone expected as a result of environmental policies enacted in China and solid growth in other parts of Asia. We expect strong oil and gas demand to persist in the year ahead leading to higher oil and Liquified Natural Gas (LNG) prices which will significantly benefit domestic producers like Woodside Petroleum, Santos and Beach Energy. Will the pace of interest rate increases accelerate or be in line with current expectations? Rising short-term Interest rates are also a perennial cause for concern with many fretting that equity markets cannot rise in the face of rising interest rates. Historical tells us this is not the case, although companies with high debt burdens that are unhedged could obviously be worse off. 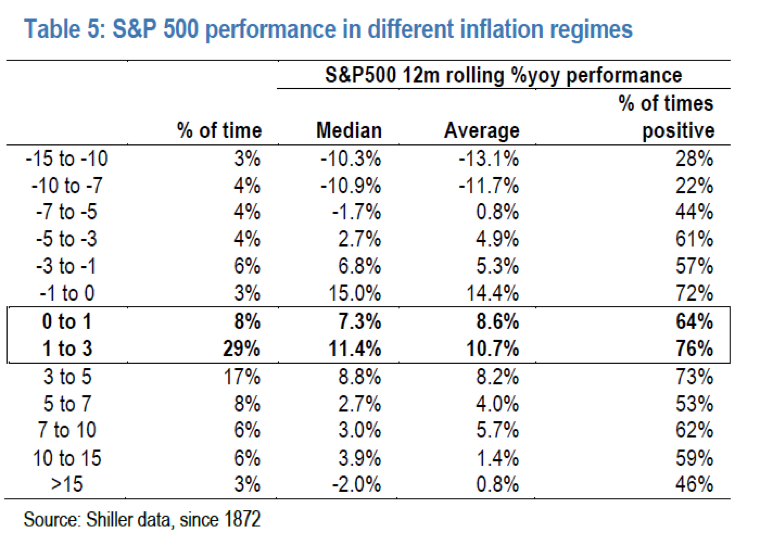 Equity returns have generally been a function of inflation regimes with the current 2% global inflation rate within the 1-3% inflation band that historically leads to solid equity market returns in the following 12 months as can be seen in the table below. Were inflation to lift or fall substantially from today's (approx) 2%, then this would certainly be cause for concern in terms of equity market return expectations. At Paradice, our portfolios are positioned for continued economic growth and higher equity markets with a preference for global over domestic Australian cyclical exposures. This positioning is unlikely to change until and unless we see a change in the economic growth outlook, an escalation in geopolitical risks or a substantial change in inflation and interest rate expectations. The analysis of information and company insight is vitally important to successful stock picking. Over time, we have developed considerable expertise in identifying valuable investment opportunities. Find out more.